Since I wont be posting pictures of my quilt for awhile, I decided to post pictures of an old project that I did for my kids. I wanted to make a quiet book for my kids, but couldn't find a pattern that I liked, so I decided to make my own patterns. I think most of them turned out okay, but as with everything else, I've learned in the process things I'll do differently if I ever make another one. 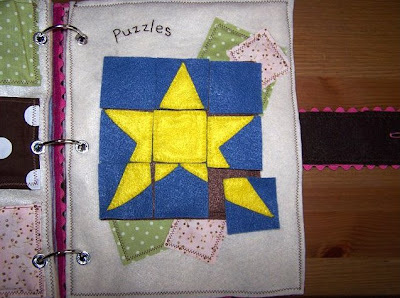 Tic-Tac-Toe page: has a pouch with pieces to play the game. 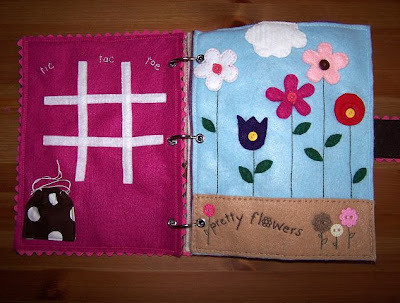 Flower page: has removable flowers that are interchangeable. Gumball page: has gumballs that come off so they can match the colors. 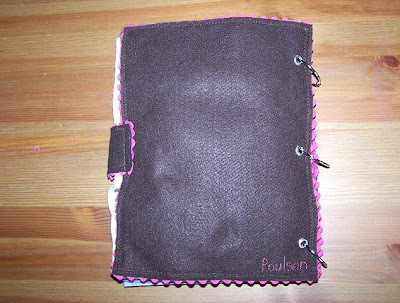 Purse page: has bracelets, play lipstick, etc. inside. 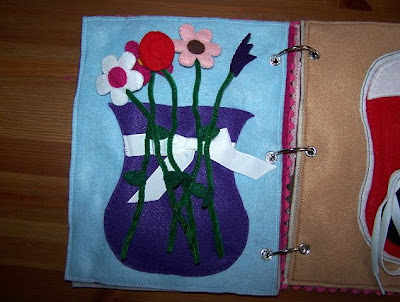 Flower vase page: the flowers are removable. This is the only page the baby can play with and she LOVES them! 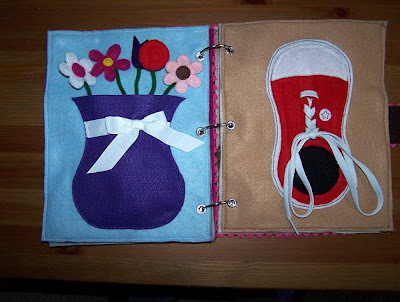 Shoe page: laces for the kids to practice tying their shoes. 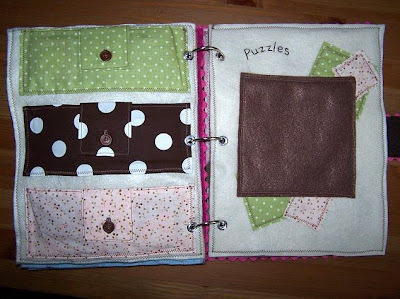 Puzzle pages: the three pockets have the pieces to three different puzzles, and the other page is for them to put the puzzles together. Shape page: the shapes are velcroed on so they can match the shapes. 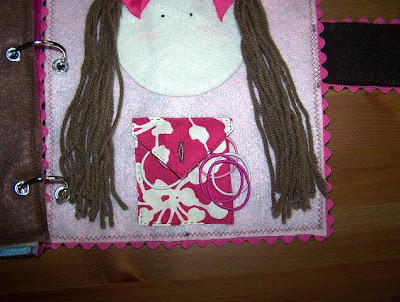 Hair page: has a pocket with hair ties so the kids can practice braiding and rubber banding the ends. I stitched our last name on the back just in case we leave it laying around at church or something. 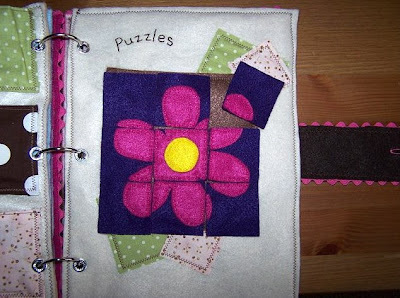 What fabric did you use for each page? It looks like felt, but I'm not 100% sure. I definitely want to try making one. You've inspired me. It is felt. Let me know if you have any questions. Good luck!! Lyric, this is so beautiful! I love the puzzle page and the gumball page. And the hair with the hair rubber bands!!! So fun. You are so talented and creative! I found you via your link to my quiet book blog. Can I put your blog down on my sidebar of "quiet book ideas"? This is such a cute one! Thank you! The felt isn't really stretching, but it's fuzzing up a little. I just bought the sheets of felt from Joann, and I'm sure they aren't as good of quality as the felt you can buy by the yard. I didn't cut them down any, so the pages are just as big. The cover is just felt with some rick rack. One thing I would advise, though, is when you use velcro to attach pieces, make sure that the "pokey" side is on the actual piece that comes off. I did the opposite, so when a piece isn't put back on and a page is turned, the pages stick together, and when they get pulled apart, more fuzzing happens. Good luck!! How did you put the grommets in your pages? Did you use a special tool for that? I love your ideas. Seriously SO easy!! Don't buy that big, expensive tool thingy ... they don't work. Just buy that little $3 - $4 kit. You have to make your own hole, and you need a hammer, but they turn out perfect and are WAY cheaper. You can find them at Joann's in the "notions" section. Good luck!! Laura, thank you for the sweet comments! It's really not as hard as it looks ... just look at one piece at a time ... not the whole picture. Good luck, and let me know if you need any help! You are a seriously talented woman Lyric! I still really want one of these, but I'm going to either have to make it for both boys and girls or make two, which isn't looking good. Anyway, you are always such a huge inspiration to me. Love you! p.s. Did you just use a cotton fabric for all the patterned pieces? and did you back them with a iron-on stiffener or anything? I did just use cotton fabric ... and probably should have used interfacing or something, but I didn't. If I were to ever make a new one I would make a few changes ... like that. I love your QB ideas! so cute! I especially love the hair idea! For the flowers, are the stems made out of pipe cleaners? I like that they are removable from the vase! Thanks for some cute ideas! I am gathering ideas to one day create a book for soon to be born little lady! Yeah, they're pipe cleaners. I folded up the bottom so that the wire ends up being under the leaf ... then I hot glued on the leaves and the flowers ... then hand sewed around the edges. I love your QB. I'm making three, and your book has really given me some great ideas. Thanks for the great post! How did you make the puzzle pieces? They don't look sewn on the sides where they would be cut. Are they pictures already on felt? Very cute ideas. I'm making a quiet book for my daughter for Christmas, and your ideas have been helpful. I was wondering how you did the shoe? I've been trying to figure out the best way to do mine. Hi Abby, Thank you! I really am not happy with how I did the shoe. I just made holes in the felt and that really wasn't a good idea. The felt has stretched all over the place. Next time I think I'll do it with maybe home decor fabric and add eyelets. Sorry I'm not more helpful! Good luck!! Wonderful book! I'll be a grandma for the first time in February and have been gathering ideas for a quiet book. You have great ideas and I'll be using many of them. Thank you for taking the time to post this! Adorable book! I love all of your different pages. Wow! This is amazing! So much thought went into this book! I love it! Thanks for sharing this great book! 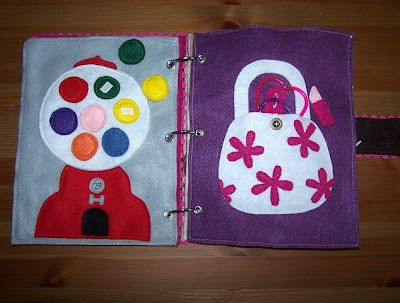 I'm anxious to make one for my granddaughters! 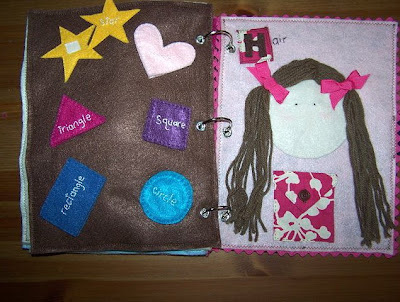 I absolutely LOVE this book..I am going tomorrow to buy supplies to start making one for my little girl! 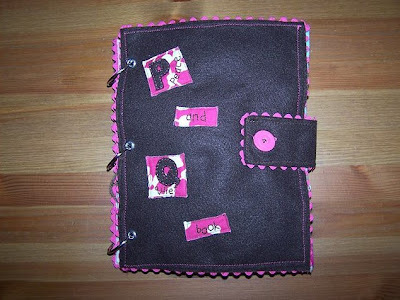 Such cute ideas..I was wondering how you made your little pouches for the pieces--are they just cotton? Also, how did you do the puzzles? I made a quiet book recently and loved looking at your pages for inspiration. Thanks for sharing. I love your quiet book. I used some of your ideas if you want to see it. I'm just getting ready to create my own. Thanks for all the ideas. Can't wait to do the puzzle page. So FUN! I love your quiet book! Brilliant! A group of friend and I are putting some together and this will really help us get started! Thanks so much! Very Gorgeous book! How did you do the puzzle pieces? Do they stick onto the page when put together? Can you tell me how you attached the hair on the hair page? And it looks like it is just yarn. How is that holding up? For the puzzle pieces did you sew everything together and then just cut the pieces? Or did you do something else? I actually just cut out the shapes and laid everything how I wanted it to look, then cut them all together. Then I hand stitched each square. Bond says....Great job this book is beautiful. 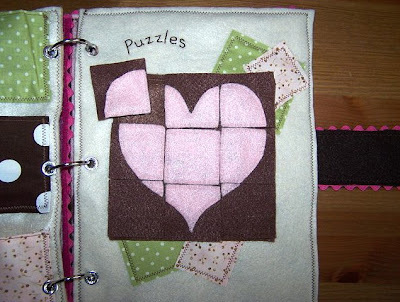 I am in the process of making one for my granddaughter and I will be using your idea of the three puzzles on one page, brilliant. I love this quiet book!! Great simple ideas!! 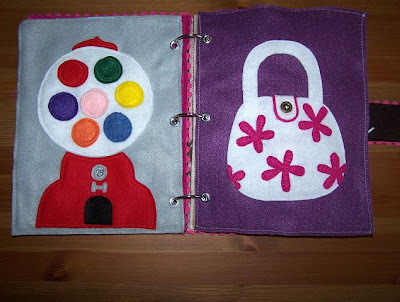 I made one of these book awhile back for one of my 8 children. Now looking for some inspiration to make three different ones for each of my grandchildren. Thank so much for inspiration!